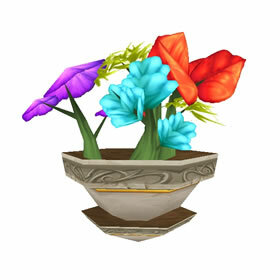 The 100 [Noblegarden Chocolate] required to purchase the pet may be obtained by looting Brightly Colored Eggs found during the event throughout all level 5 starter towns. For Horde players, Falconwing Square seems to be the best place to farm for anything Noblegarden-related. In just under an hour, I looted the 500 chocolates I needed for the mount, and also found 3 rabbits in the eggs. Don't even bother mounting between the eggs if you equip an egg basket; just use the speed boost of the basket, and your only downtime will be from emptying your bags. I have to agree that it looks pretty, and it is easy to get. As it's my first Noblegarden I wanted it, the Spring Rabbit and the Mount, so prepared to gather up 700 eggs, but ended up only needing 600 as the Spring Rabbit dropped about 6 times from the eggs themselves. Considering how many Tux Shirts, Trousers, Robes, Dresses, Bouquets, Rabbit Ears, and Sprigs also dropped, I may have ended up collecting the 700 egg gather ordeal that I had prepared myself for! Congrats to everyone that received their new pets. Cannot be caged, so it cannot be sold or traded. Does not battle or level. It is very very easy to get though at least, so it's not like it takes major time or effort to collect one. I ran about and grabbed up 104 eggs, 4 containing items, the rest only chocolate. Took about 25 minutes! Just an FYI on this pet. It's true, you can't battle with it or trade it...BUT, you CAN level it up by using training stones that you get from Erris the Collector. I have already leveled up 1 pet using these stones (K'ute), and I'm sure it will work for this one too. Just farmed the 100 chocolates to buy this in about 45 minutes. I got 5 other items along the way, so 105 eggs total in that time. My best hint: find an egg, then stand there & be ready to right-click whenever one spawns. Zoom in so the eggs almost fill your screen. Spawn time seemed to range from 5-60 seconds. I like to find a clump of trees, or a bush, or some other out-of-the-way place to avoid having eggs stolen out from under you. NOT TRADEABLE. Buy only 1! Not only this pet is NOT battle pet (You can't fight with it, level it), but it's also not tradable..
Plus, have in mind that a friend can't buy this pet for You. So You have to work by Yourself. If You don't have WoW subscription, don't worry. You can gather eggs with any low level character with veteran account (You can play without subscription). Will this be a tradeable item? I'm unable to play right now and don't want to miss out getting one. what a brilliant idea! Can't wait!!! i cannot wait for my flower bouquet of death ! Lololol.... but what does it dooooo?